This chapter defines peer coaching and addresses the objection that often surfaces in reaction to the word coach. Various types of peer coaching activities are discussed, and three approaches to peer coaching are explained. If you are using this chapter as part of a workshop, after presenting the definition, consider asking participants to respond to the following question: “In the best of all possible worlds, what would you want peer coaching to look like, sound like, and feel like at your site?” Record participants' responses and then ask participants to brainstorm what they would like to call their program. Examining desired outcomes and naming the program serve to build ownership and commitment. Peer coaching is a confidential process through which two or more professional colleagues work together to reflect on current practices; expand, refine, and build new skills; share ideas; teach one another; conduct classroom research; or solve problems in the workplace. Although peer coaching seems to be the most prominent label for this type of activity, a variety of other names are used in schools: peer support, consulting colleagues, peer sharing, and caring. These other names seem to have evolved, in some cases, out of teacher discomfort with the term coaching. Some claim the word coaching implies that one person in the collaborative relationship has a different status. This discomfort is to be expected because the label may imply to some an inequality among colleagues that is inconsistent with the historical norm of a nonhierarchical structure within the teaching ranks. As research and experience inform us, “The reality is that a teacher has the same ‘rank’ in his or her last year of teaching as the first” (Sizer 1985). Teachers have the same classroom space, number of students, and requirements. Regardless of how coaching relationships are labeled, they all focus on the collaborative development, refinement, and sharing of craft knowledge. Peer coaching is as individual and unique as the people who engage in it. Some peer coaching involves two or more colleagues working together around the shared observation of teaching. In this instance, there is generally a pre-conference, an observation, and a post-conference. The teacher who invites a coach in, referred to as “the inviting teacher,” steers the coaching process. The inviting teacher identifies the focus of the observation, the form of data collection, guidelines for the coach's behavior in the classroom during the observation, the parameters of the discussion of observed teaching, and the date and time of the observation. This approach will be discussed in detail in Chapter 4. Other types of peer coaching might involve a pair or a team of teachers co-planning a lesson or curriculum unit. Still other types might involve problem solving, videotape analysis, or study groups. Some coaching may occur between an expert and a novice or between experienced and less-experienced teachers. Shulman (1991) suggests still another approach in which teachers share stories about teaching experiences. This approach conceptualizes teaching as a narrative act and provides a nonthreatening way for teachers to share pedagogical knowledge. For example, within a small group of teachers, one teacher discussed how she explained to students why certain elements on the periodic table are called noble elements. The metaphor she related to students suggested that noble people have everything they need; therefore, students should remember that noble elements don't need anything, either. Another teacher recalled a story of how nobility tend not to mix with other social groups. Noble elements, accordingly, don't mix with other elements. By sharing stories in this way, teachers increase their technical repertoire within a “safe” context—teachers feel safe because the activity in which they collaboratively engage is storytelling and cannot be confused with advice giving, an activity shunned in many school cultures. Other teachers have used the peer coaching process to conduct action research. In this situation, a teacher formulates a set of hypotheses about classroom practices and develops a plan to test them by asking a colleague to observe and take notes. Later, the colleagues discuss and analyze the data. Some teachers have kept reflective journals of their findings over time. An additional form of out-of-classroom coaching is called “Talk Walking” (Caro 1991). This strategy is designed to help teachers engage in (1) collegial dialogue focused on instructional and curricular issues and (2) physical exercise, an element frequently missing from the teacher's work day. When Talk Walking is used in a workshop, it can help teachers integrate new learnings with existing classroom practices. After a workshop segment has been completed, teachers are asked to reflect on how they might use the content they have just learned back on site. They then pair up and go outdoors for a walk, during which they discuss their reflections about the applicability of the training to their own classrooms. Talk Walking can also be used in the schools, independent of a workshop. In this setting, teachers arrange a time to meet for a walk during which they might discuss plans for a specific lesson, reflect upon a unit that has been taught, talk about specific students, or share recent reflections or learnings related to curriculum and instruction. Collegial dialogue of this nature has both cognitive and physical implications for teacher growth. It also fosters the development of trust among colleagues committed to sharing craft knowledge and serves to create professional norms of experimentation while encouraging teachers to learn from one another. In the all too busy day of a teacher's life, Talk Walking brings exercise and fresh air—two important elements for teaching and thinking—into the daily routine. The forms peer coaching can take are limitless. It might focus on instructional strategies, curriculum content, classroom management practices, specific students, particular problems, or instructional skills such as questioning techniques or process skills to generate higher-order thinking. These activities might occur within the classroom or in the teachers' lounge or workroom. Two individuals, a trio, or a team might work together in peer coaching arrangements. Figure 1.1 shows a variety of the forms peer coaching can take. These may be formal arrangements and involve a structured pre- and post-conference focused around an observation, or informal arrangements such as a storytelling session. The mastery of a technical repertoire increases instructional certainty; reflective practice enhances clarity, meaning and coherence; research fosters investigation and exploration; collaboration enables one to receive and give ideas and assistance. Each aspect has its separate tradition of research and practice. These aspects should be integrated and offer a useful framework for conceptualizing a variety of coaching activities that have at their core the notion of the teacher as learner. 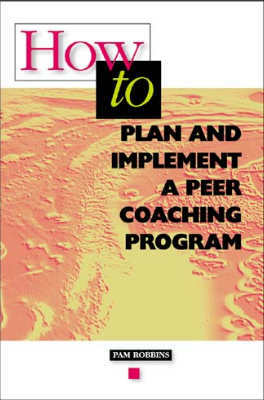 There are a variety of approaches to peer coaching. One type is designed to help teachers transfer into classroom practice new skills they have learned in a workshop or training session. This type of coaching usually follows training in specific strategies or methods. For instance, if the training has addressed the elements of a lesson strategy such as concept attainment, the coaching process would revolve around how the teacher is implementing that strategy in the classroom. Teachers pair with consultants or one another so that feedback can be given about the application of the new strategy in the classroom. The focus of peer coaching activities in this context is directly related to the workshop or training content. Research has shown that this approach promotes skill transfer (Joyce and Showers 1980). However, if this is the only form of coaching that teachers experience, the process may become routine and the coaching may turn into coaching as unreflective practice (Hargreaves 1989), wherein teachers simply go through the motions of labeling the implemented behaviors and consequences. When this happens, the aspects of the lesson about which the teacher is genuinely curious may go unaddressed (Robbins 1984). To be effective and sustained over time, coaching activities must have a deliberate focus. And the focus must be one that matters to the individuals involved. Other approaches to peer coaching involve colleagues working collaboratively around issues unrelated to a specific focus generated by shared training. This type of peer coaching relies on a teacher-specified focus. Here the approach is intended to increase professional sharing, to refine teaching practices, and to enhance teacher reflection. It may also include conducting action research, solving problems related to instruction or curriculum design and delivery, or resolving problems with specific students. Regardless of the type or approach, peer coaching efforts all share a collaborative quest to refine, expand, and enhance knowledge about the teaching profession. These approaches make learning about the business of teaching accessible to all teachers in the workplace. While coaching activities may involve only segments of a school staff, collectively they can increase the climate of collegiality if they become an integral part of life at the school and if the school culture provides a hospitable environment. But this is not always the case. Ironically, some of the same factors that provide a rationale for coaching cause coaching attempts to be stifled or fail. Chapter 2 addresses this irony. Copyright © 1991 by Association for Supervision and Curriculum Development. All rights reserved. No part of this publication—including the drawings, graphs, illustrations, or chapters, except for brief quotations in critical reviews or articles—may be reproduced or transmitted in any form or by any means, electronic or mechanical, including photocopy, recording, or any information storage and retrieval system, without permission from ASCD.